The previous article discussed the substantial risks involved in the heavily subsidised deployment of currently available renewable energy technology. Even though these downside risks are large by their own accord, there exists a number of external factors that can further augment these risks. The external risks in question here are factors like high and increasing levels of debt and unfunded liabilities, rising inequality and structural unemployment, and shifting demographics. Much can be written about each of these subjects, but such discussions are beyond the scope of this article. Here, we will only show some worrying trends for the country most representative of an energy intensive western way of life. 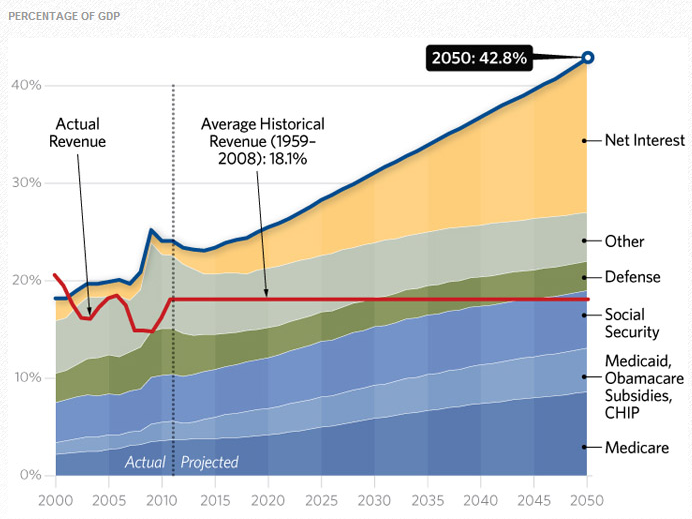 Here are the potential consequences of excessive debt and unfunded liabilities in an aging population (Heritage.org). 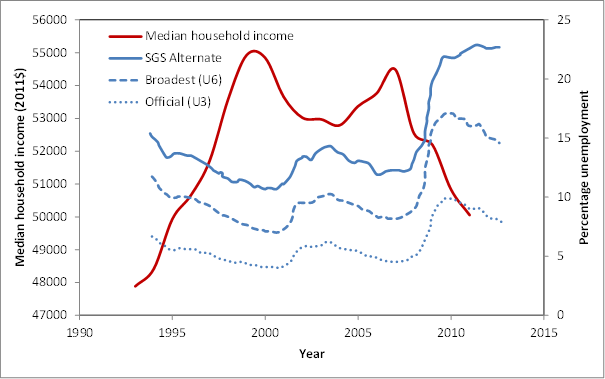 And here are current trends in median income (US Census Bureau) and unemployment (Shadowstats.com). These charts pretty much speak for themselves, so no more discussion on this topic is required. 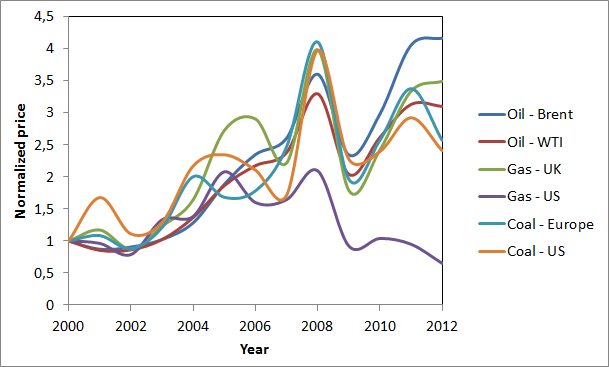 Here we will only consider the primary effect of these factors: stagnating or even negative economic growth. Sustained exponential economic growth is a prerequisite for a continued rollout of renewable energy infrastructure. On the one hand, economic growth puts pressure on finite fossil fuel resources, thereby increasing prices and making alternative sources more attractive. As shown below, global oil, coal and gas prices have essentially tripled since the turn of the century (with the exception of US shale gas). This is good news for renewables, but also poses further headwinds to economic growth. On the other hand, a healthy and growing economy is required to provide the generous subsidies necessary to continue the deployment of renewable energy and to support aggressive renewable energy R&D. Countries like Spain and Greece have clearly shown what happens to renewable energy deployment under adverse economic conditions. The central problem is that renewable energy subsidies generally come in the form of long-term commitments to pay above-market prices to renewable energy stakeholders. This is well and good as long as disposable income grows faster than the associated rise in energy costs and the knock-on inflation in other commodity prices, but as soon as the economy stagnates or starts contracting, the picture suddenly looks very different. Under such conditions, the priorities of society change dramatically and the renewable energy industry gets hit by retroactive subsidy cuts. Such cuts lead to bankruptcies and a loss of confidence, ultimately resulting in much wealth destruction and wasteful litigations. Indeed, for renewable energy to continue expanding, the global economy must grow. This is mandatory. To support renewable energy implicitly implies great optimism about the potential positive impacts of unknown future technological breakthroughs. The most direct form of techno-optimism is the belief that technology will deliver scalable alternative energy technologies capable of displacing fossil fuels in an open market. The improbability of this belief was discussed in a previous article. In addition, under the conditions outlined in the previous section, renewable energy optimists must implicitly be growth-optimists. And growth-optimists are per definition also great techno-optimists. Indeed, if exponential economic growth is to continue on our finite planet, we will have to see some rather amazing technological breakthroughs. Due to resource and pollution constraints, we can no longer grow by simply applying old mass production techniques in new regions. No, we have to learn to procure and use our resources more efficiently so that we can continue creating more value per unit time. Whether this is in fact possible is another topic of intense debate. On the one hand, the amount of useful information available, the number of educated minds capable of building on this information and the amount of processing power at the disposal of these educated minds are increasing so rapidly that one can easily expect something magical to emerge sooner rather than later. 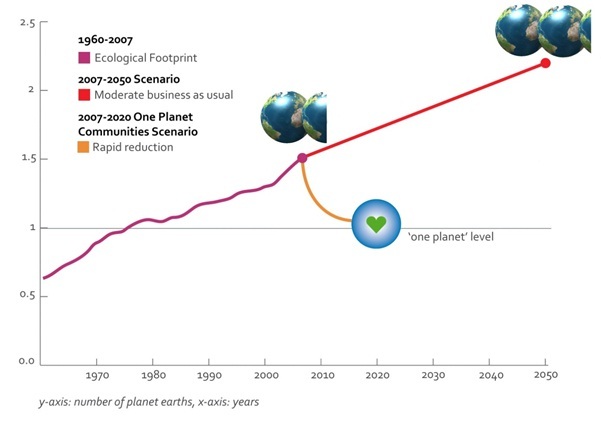 But on the other hand, the number of unsustainable trends within our environment, our economy and our society is truly staggering and anyone with a rudimentary understanding of non-linear system dynamics will appreciate the substantial downside risks posed by this highly complex and interconnected system pressing against its physical boundaries. It is very important that renewable energy advocates become aware of the assumptions implicit in their views. The most important of these assumptions is that exponential economic growth can continue uninterrupted over coming decades despite environmental factors like peak oil and climate change, economic factors like unpayable debts and unfunded liabilities, and societal factors like increasing inequality, shifting demographics and aging populations. To me personally, this assumption appears to be highly suspect. Regardless of the arguments in the above paragraphs, however, renewable energy forms an important part of the “all of the above” strategy we will need to follow in order to recover from our current position of large (and increasing) ecological overshoot in a controlled and peaceful manner. The only point of this and previous articles is that the fundamental limitations of renewable energy dictate that this role should be small until we reach the point where renewable energy genuinely becomes the most economical option.